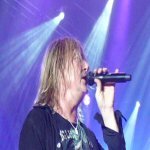 Def Leppard singer Joe Elliott was interviewed earlier today by Planet Rock and said he hopes the band will tour the UK in Spring 2015 with a new album. Joe was asked about the recent album sessions and any plans for a UK tour. He said he hopes they will tour the UK next Spring following the release of the new studio album. Wyatt - UK Tour In The Next 18 Months? "Well yeah. My theory would be - you know the KISS thing will not come here. It just can't you know. The infrastructure in the UK is vastly different to America. To do 42 shows co-headlining with KISS - to do the six that we did with Motley Crue was an absolute nightmare to coordinate all their stage stuff and ours. And it's just it's impossible to do but with this new album coming out next year. I'm hoping and I'm saying this out loud, totally off the top of my head. I'm hoping that we can maybe do some proper shows in the UK some time like mid to late Spring next year. That would be my plan." "Yes, we've started working on a new album which will be out next year. We got together at my place in - the day after I finished the Down 'N' Outz album Leppard turned up at my house. I mean - this is how crazy my life is. Nut I mean I can't complain. Most people are dying to work like we are. I'm dying for a bit of time off!. And we turned up in February for a writing session thinking we might get two or three songs and we've got twelve cooking. And three of them we could release tomorrow. So we're not hanging about and it's very varied. It's exactly what you'd expect from us. There's a bit of this, there's some pop, there's some rock, there's some mad epic stuff. There's everything you know cause everybody writes very differently and it's a great team project."